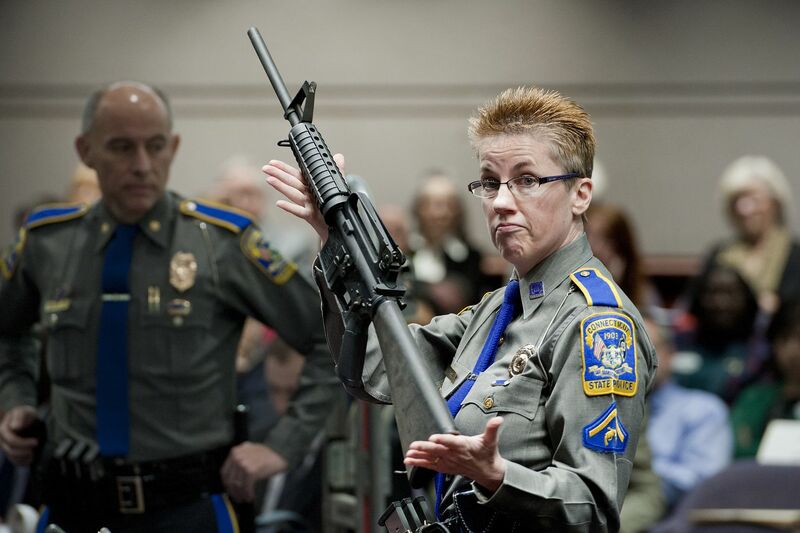 In this Jan. 28, 2013, file photo, firearms training unit Detective Barbara J. Mattson, of the Connecticut State Police, holds a Bushmaster AR-15 rifle, the same make and model used by Adam Lanza in the 2012 Sandy Hook School shooting, during a hearing at the Legislative Office Building in Hartford, Conn. A divided Connecticut Supreme Court ruled, Thursday, March 14, 2019, gun maker Remington can be sued over how it marketed the Bushmaster rifle used in the massacre. The families argued, among other things, that the rifle's manufacturer and distributor negligently allowed and encouraged civilians to use a weapon suitable only for military and law enforcement use. The Connecticut high court disagreed. It also said the suit, which seeks unspecified damages for each death, could go forward under that state's Unfair Trade Practices Law.